Original Editors - from Bellarmine University's Pathophysiology of Complex Patient Problems project. Cancer is created in the body when abnormal cells begin to rapidly multiply. These cancer cells can end up traveling to other parts of the body if they enter into the bloodstream and/or lymph vessels. The term 'metastasis' refers to the process in which cancer cells travel to a new place and begin to grow in its new location. A cancer is always named for the place that it first formed; this is called its primary site. For instance, if a person has breast cancer that has spread to the bone, it still is labeled as breat cancer and not bone cancer. Cancer that actually originates in the bone is called primary bone cancer and is less common than a bone metastasis. The definition of a skeletal metastasis is a cancer of the bone that has originated from another site. 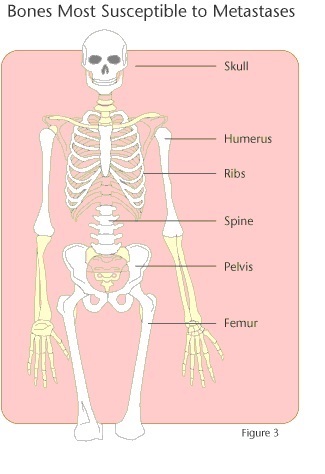 Bones are a common site for certain cancers such as breast cancer and prostate cancer. The most common sites for skeletal metastases are the spine (this is the most common site), pelvis, femur, humerus, ribs, and skull. Skeletal metastases are common with other cancers. When one gets skeletal metastases, this usually means one has an advanced cancer. “Its prevalence is rising due to higher rate of diagnosis, better systemic treatment, longer lives with the disease and higher disease burden rate”. There are two types of bone cells, osteoblast and osteoclast. Osteoblast is the forming of new bone, the tumor signals to the bone to overproduce bone cells. Osteoclast is what dissolves the bone, leaving weakened bones. With osteoclast, you develop osteolytic lesions which are when the bone breaks down. This allows excess calcium to be released into the bloodstream. Osteoblastic or osteolytic changes will be seen in most cancers, sometimes both are seen. This 3-minute computer-animated video explains the process of cancer spreading to bone and how the cancer affects the bone once it has implanted. The most common symptoms of skeletal metastases include pain, fractures, and anemia. Pain usually is worse at night and may get better with movement, but can become constant and may be worse during activity.Pain is usually localized to the site of metastases, but can refer to areas around the site. Pain usually increases to severe intensity. Metastases in the bones producing blood cells in pelvis, ribs, spine, skull, upper arms, and long bones of legs may cause abnormalities in blood cells. Anemia is a common abnormality for patients with skeletal metastases, especially with chemotherapy and radiation therapy. Patients exhibit weakness, fatigue, and shortness of breath. Patients with a white blood cell abnormality are prone to infections; whereas, patients with deviations in platelets counts cause abnormalities in bleeding and clotting. Any cancer can metastasize into the bone. The most common metastasizing cancers include prostate, breast, kidney, thyroid, and lung.Cancers that have metastasized to other organs or the lymph system are more likely to metastasize to bone. If a person has cancer, lab tests and imaging tests may be done to see if the cancer has spread to other sites. This is how skeletal metastases are discovered in their early stages. In other situations, symptoms of skeletal metastases may be the first indicator that the cancer has spread. These symptoms include bone pain, fractures, symptoms of spinal cord compression, and/or symptoms of hypercalcemia (these symptoms are explained in more detail under 'Characteristics/Clinical Presentation'). Lab tests and imaging tests are then performed to confirm whether or not a skeletal metastasis is causing these symptoms. X-rays Often the first test performed if a person is having symptoms of a skeletal metastasis. X-rays help to show the bone density and can also indicate if there are any fractures in the bone that may have been caused by cancer. X-rays can tell if osteolytic or osteoblastic changes have occurred. Lesions appear as lighter, darker, or holes in bone. There is at least 25-75% loss of mineral before lesion is visible on an X-ray. By the time the lesions are visible, there is significant damage already done. Bone Scan Injects with radiotracer, then special x-rays taken to find site of metastases which will show up darker and denser. Sometimes can be hard to differentiate from infections, arthritis, and old fractures. Can follow the progression of cancer. Better for osteoblastic. 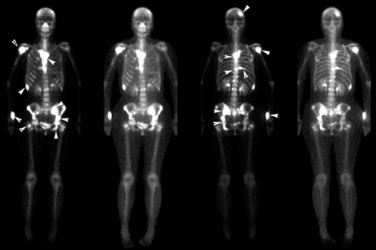 Computed Tomography (CT) Shows cross-sectional images of the body. Often used if a metastasis is thought to be osteolytic since a bone scan may not show the tumor. Shows size and shape of tumor. Tumor Markers Certain cancers release substances called 'tumor markers'. These can be detected through blood tests and higher levels of tumor markers indicate that cancer has spread in the body. However, this test does not help indicate where the cancer has spread. Other Blood Tests Can suggest there is a lesion present, but cannot diagnose skeletal metastases. Cancer can cause increased levels of calcium and alkaline phosphates in the blood. Blood tests can help show if these levels are higher than normal. Urine Tests If the bone has become damaged by skeletal metastases, certain substances may be released into the urine. N-telopeptide is measured. Magnetic Resonance Imaging (MRI) Shows cross-sectional images of the body using radiowaves and strong magnets and is useful at looking at the spine and spinal cord. It is the test most often used if a person is experiencing symptoms of spinal cord compression looking at nerve roots being compressed by tumor or bone fragments. Used to define a bone mass and can determine if it is a tumor, infection, or bone damage from other causes. Positron Emission Tomography (PET) Shows the whole body at once and is useful in detecting tumors throughout the body. Injected with a slightly radioactive form of sugar which collects in cancer cells. Can find small tumors not seen on other tests. The scans are not very detailed and so if cancer is thought to be seen, MRI or CT scans are used to have a more thorough scan. Needle Biopsy There are two types--fine needle biopsy and core needle biopsy. With fine needle biopsy, a thin needle is inserted and a little bit of fluid and tissue fragments are removed from the tumor. With core needle biopsy, a larger needle is used to remove a small cylinder of tissue. The samples are then looked under a microscope. CT used to guide needle. Surgical Bone Biopsy With this test, the bone is cut into and a small part of the tumor is removed and inspected under a microscope. Diagnoses of the type of cancer is done this way. Metastatic bone cancer starts with a tumor within another organ of the body. Cancer cells that break from the tumor and travel to and through the circulatory or lymph system. Some of these cells have an outer make up that helps to adhere to the bony network of cells. Other cancer cells secrete a substance to change the bone cells for easier attachment or increased growth of the cancer cells that do metastasize in the bone. Once the cancer is within the bone, it either increases production of osteoclasts or osteoblasts. An increase in osteoclasts weakens the bone leading to the increased risk of fracture. An increase in osteoblasts amplifies the production of bone cells causing sclerotic changes in the skeletal system. Besides the metastases, systemic treatment can produce side effects throughout the body; including blood pathology, nerve damage, kidney damage, and heart damage. Chemotherapy: this is the main treatment used for skeletal metastases and often can help shrink the tumors and reduce the symptoms caused by the cancer. With chemotherapy, anti-cancer drugs are put into the body by mouth or through a vein. Can shrink tumors, but doesn’t make them go away. Usually done with other treatments. These drugs can affect both cancer and normal cells because the drugs can’t tell the difference. Damage of healthy and cancer cells cause side effects. Some side effects of chemotherapy are: loss of hair, loss of appetite, nausea and vomiting, mouth sores, diarrhea, increased chance of infection, problems with bruising and bleeding, and feeling weak or fatigue. Side effects depends on type and amount of drugs and how long chemotherapy is. Hormone Therapy: Some hormones contribute to the growth of cancers. By keeping these hormones from affecting the cancer cells, certain types of cancers can be treated. Hormone therapy has multiple approaches. One approach is to surgically remove the organ producing the hormone. The more common approaches are prescribed drugs that can either keep the hormones from being produced or keep the hormones from affecting the cancer cells. The most common side effect of hormone therapy is hot flashes, but can depend of type of hormone therapy used. Immunotherapy: With this type of treatment, the immune system is strengthened to help fight the cancer cells. Man-made versions of proteins to kill cancer cells. The side effects vary but may include fever, chills, nausea, loss of appetite, rashes, and fatigue. Radiopharmaceuticals: Drugs that have radioactive elements are injected into the body through a vein. The drugs go into the cancerous bones and work to kill the cancer cells. Works better than external beam, but could be combined treatment. This treatment can reduce pain and be done more than once, but with reduced effects. Works best for osteoblastic. The main side effect is a lower blood cell count which can increase the risk for infection and bleeding. Bisphosphonates: Drugs that work to slow the breakdown of bone (this can be caused by certain skeletal metastases) can be taken by mouth or given through a vein. Cancer treatments are usually done intravenously. Benefits of bisphosphonates are that they can help with the following: reduce bone pain, slow down bone damage, lower high blood calcium levels, and decrease risk for broken bones. Common side effects are fatigue, fever, nausea, vomiting, diarrhea, anemia, weakness, arthralgia, myalgia, and bone/joint pain. Something to be cautious about is that another side effect is osteonecrosis of the jaw (a portion of the jaw lacks blood supply and dies). It is important to have routine dental check-ups. Denosumab: A drug that helps slow down the breakdown of bone and reduces chance of developing a fracture. It is injected under the skin every four weeks. Common side effects are nausea, diarrhea, and fatigue. High likelihood of causing low blood calcium, usually need to take calcium and vitamin D supplements. Bone cement: Bone cement can be injected into a bone to help stabilize and reduce symptoms of pain. Multiple types of cement with different effects. External Radiation Therapy: This is similar to receiving an x-ray except the radiation beams are much more intense. Radiation helps to destroy cancer cells or helps to slow down the growth of tumors. Can be done in large or small doses. Side effects are: fatigue, loss of appetite, blistering and peeling, and low blood count. Side effects can be reduced with the right dose and aim of the beam. Ablation Therapy: Heat, cold, or chemicals may be used to destroy tumors. This is performed by placing a needle or probe directly into the tumor. This treatment is often well tolerated and a person can usually return to their normal activities in a few days. Used only on 1 or 2 tumors. CT can be used to guide the needle. Several types of techniques done, patient based as to which one is used. Surgery: This is done to help reduce a person's symptoms and to help stabilize a weakened bone. Screws, plates, pins, and rods can be used to help keep a bone from staying unstable. Surgery should not be rushed or first choice of treatment. It could cause permanent or irreversible harm to the patient. Pain medications: Bone pain is a common symptom of skeletal metastases. Pain medication taken by mouth is the most common method. Common medications used to start with are acetaminophen (Tylenol) or non-steroidal anti-inflammatory drugs (NSAIDS) such as ibuprofen (Motrin). If these drugs are not helping reduce the pain, opioids such as codeine, hydrocodone, morphine, and oxycodone may be prescribed. Side effects for these medications vary and should be looked into before beginning a medication. Physical therapy intervention focuses on optimizing the functional capacity of patients, keeping patients from becoming bed-bound, preventing pathological fracture, and helping them to maintain as much independence as possible. Thus, therapy takes on more of a maintenance or palliative role with these individuals. There is a great risk involved with working with skeletal metastasis, with the primary risk being additional fractures. Patients should be informed of this risk and that the alternative treatment of bed rest can have devastating side effects as well. In a study conducted by Bunting et al. in 1985, fifty-four patients with bony metastases but no evidence of impending fractures on skeletal survey were observed while they underwent rehabilitation programs at a rehabilitation hospital. 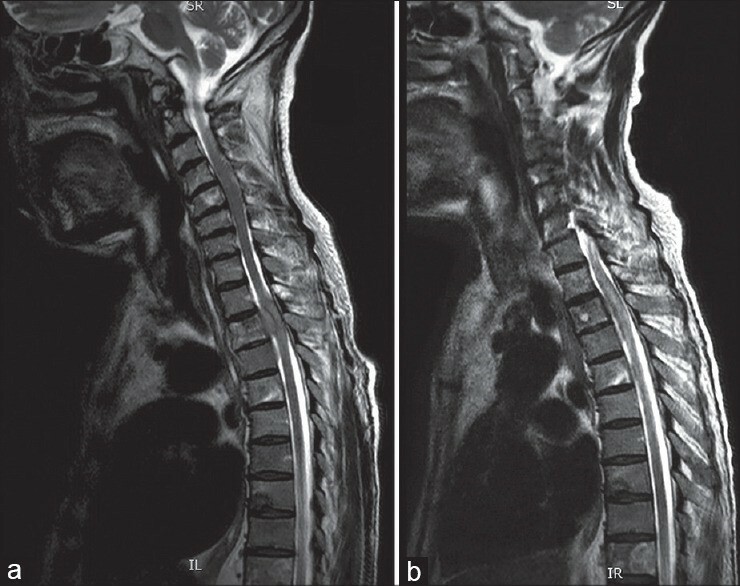 During this treatment period, 16 fractures occurred in 12 patients, but only 1 of these clearly occurred while the patient was participating in rehabilitation activities. Six fractures clearly occurred while the patients were in bed. This evidence suggests that an intervention of bed rest would not prevent fractures any more than rehabilitation would cause fractures. Manual muscle testing, passive or active-assisted range of motion are not evaluated on an extremity with a bony lesion due to risk of fracture. Only active movement is assessed, and this is likely to be limited by pain. Likewise, resistive exercise involving an affected area is generally contraindicated. Treatment sessions, when appropriate, should focus on training the patient to use residual function or to develop compensatory techniques, assistive device training, and educating both the patient and family members. In summary, effective rehabilitation can help prevent a patient with skeletal metastases from becoming unnecessarily or prematurely bed-bound and/or dependent in activities of daily living. While achievements may be limited, they can be invaluable in helping the patient maintain some control over his or her life. ↑ 1.0 1.1 1.2 1.3 1.4 1.5 1.6 1.7 1.8 American Cancer Society. Understanding Your Diagnosis. http://www.cancer.org (accessed 21 March 2013). ↑ 2.0 2.1 Zometa. Bone Metastases. http://www.us.zometa.com (accessed 21 March 2013). ↑ 3.0 3.1 OncoLink. Bone Metastasis Treatment with Medications. https://www.oncolink.org/cancers/bone/bone-metastases/bone-metastasis-treatment-with-medications (accessed 1 April 2017). ↑ 4.0 4.1 4.2 4.3 4.4 4.5 4.6 4.7 Indian Journal of Orthopaedics. Management of skeletal metastases: An orthopaedic surgeon’s guide. https://www.ncbi.nlm.nih.gov/pmc/articles/PMC4292329/ (accessed 27 March 2017). ↑ 5.0 5.1 5.2 5.3 Society of Interventional Radiology. Nonsurgical Treatments for Metastatic Cancer in Bones. http://www.sirweb.org (accessed 26 March 2013). ↑ 6.0 6.1 6.2 American Academy of Orthopaedic Surgeons. 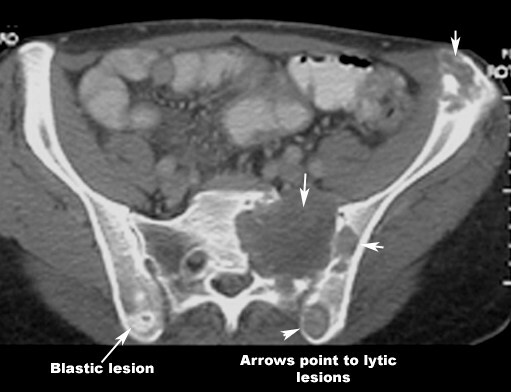 Orthoinfo:Metastatic Bone Disease. http://orthoinfo.aaos.org/topic.cfm?topic=a00093 (accessed 23 March 2013). ↑ Cleveland Clinic. Treatments and Procedures. http://my.clevelandclinic.org(accessed 26 March 2013). ↑ Prostate Cancer Foundation. Managing Bone Metastases and Pain. http://www.pcf.org (accessed 28 March 2013).